Ridge expansion is a technique used to restore the lost bone dimension when the jaw ridge gets too thin to place conventional implants. In this procedure, the bony ridge of the jaw is literally expanded by mechanical means. Bone graft material can be placed and matured for a few months before placing the implant, however in most cases the implants are placed simultaneously with the ridge expansion. 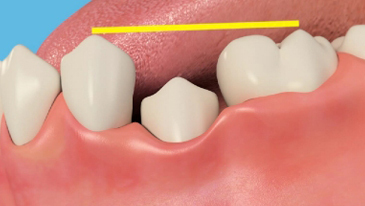 Ridge expansion: This is a technique of splitting a thin ridge of bone to make it wider so that an implant can be placed between the two sides of bone.